Tiscali has confirmed the roll-out of its TV service to major towns and cities in the UK. The company says the service will now be able to reach five million homes. Before March, the TV provider was known as HomeChoice and was available only within the London area and Stevenage. Now it will be available in areas including Milton Keynes, Hemel Hempstead, Birmingham, Wolverhampton, Leicester and Liverpool as well as parts of Manchester. Tiscali says it plans to expand the service still further, aiming for 10 million homes by Christmas including more in the north of England and Scotland. Tiscali TV provides video-on-demand (VoD) services, as well as the Freeview channel package. 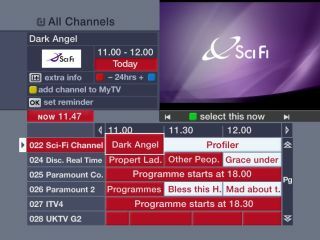 Since the early summer it has also carried the Sky basic channels that were so problematic for Virgin Media as part of an 80 channel-strong package. Tiscali bought IPTV pioneer HomeChoice in 2006. The service originally launched in 2003. You can get Tiscali TV on specific unbundled exchanges - the company offers a £20 'triple-play' package including a phone and broadband service.